Advice North Somerset Conference success! 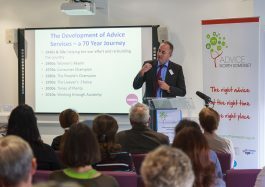 A big thank you to all who attended the Advice North Somerset Conference on 17th September. Nearly sixty people from 38 organisations attended and took advantage of the opportunity to network with colleagues from the advice & information sector. After a welcome and introduction from Anne Richards, Project Director and Lead Partner of Advice North Somerset, keynote speeches were delivered by Michael Bell, MBARC Associates on “Social Welfare Law – the gap in service provision and why it matters” and Sara Leeroth, North Somerset CAB on her “View from the Coalface”. This was followed by workshop sessions held on Digital divide, Referrals, Social Policy, Access and Demand and Advice North Somerset. Now all we have to do is capitalise on the momentum and energy generated by the Conference. Our first action is to set up a quarterly Advice North Somerset forum and the first meeting will be in early December. Details will be posted on the website as soon as possible.